Victoria hotel in Borovets ski resort in Bulgaria. - 10 % discount until 31 Oct 2017! Location: Victoria hotel is a cosy, alpine type hotel, situated amidst beautiful pine forest in Borovets ski resort. 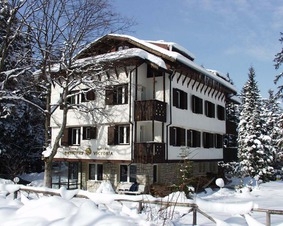 The hotel is located close to the centre of Borovets and the ski lifts, which are approximately 10 minutes walk away. Accommodation: Victoria hotel offers 12 cosy and 2 luxurious apartments. Each room is comfortably furnished and offer satellite TV, telephone, mini bar and individual bathroom. There is a fireplace in the apartments. Wine & dine: Victoria hotel offers a cosy traditional mehana, serving delicious local and international dishes and wines. The covered winter garden of the hotel offers hot drinks and cocktails. Spa centre: The hotel offers a small sport centre with a fitness hall, sauna and a bubble bath. Massages are also available. Services: Personal safes at reception, room service, ski storage, Wi-Fi internet, parking.